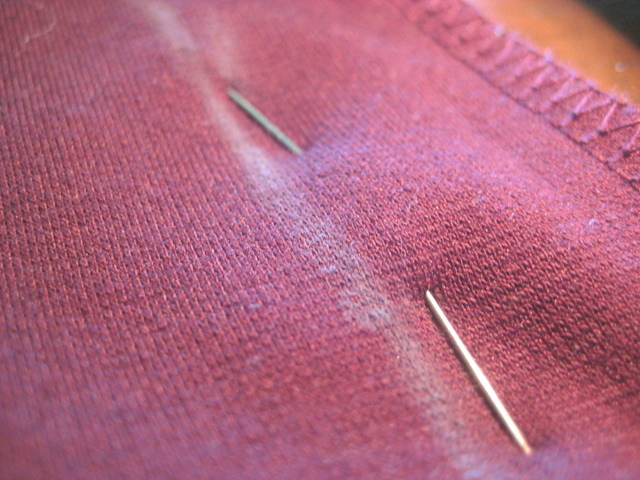 Basic sewing skills are handy for an avid thrifter. Sometimes when I'm shopping, I'll come across a garment that has a ton of potential. It's a pretty color, it's my favorite style, it's a name brand... but it doesn't quite fit. In these situations I try to tailor the piece, especially if it's something I know I'll wear a lot. And speaking of removing the dress, I made sure all of the pins were pointy side up so I could slide the dress down without getting stabbed. This is key. Nobody wants a puncture wound. Anyway, once I was happy with the fit, I removed the dress and drew myself a chalk guide line. Why the chalk? The pins were in a bad spot for sewing. Placing them vertically made it easy for the beginning of the process, but the heads were in the way of my machine's clamp. So I just took them out! I wasn't worried about the fabric getting out of place because it was on the sturdy side, and I was sticking pretty close to the original seam. There wasn't much room for error, so I went for it. No more stomach pouch! Great success. So the next time you're thrifting and you find something that's not quite right, give tailoring a shot! I don't have any formal training (just trial and error), and I promise it's easy. I worked on this over two days, but the total time, including picture-taking, was only a couple of hours. It's definitely worth it. Have you tried your hand at any clothing alterations? Great job! My son has started doing this with shirts. He is slender and tall, so he has a hard time finding things to fit. His stitching isn't very perfect, but it works for him. I am sure your son's stitching will very soon get perfect. It is amazing that he is interested in sewing! Great post! I'm pear-shaped, so I usually have dresses tailored on top. I have a dress sitting in my closet right now that needs some fitting around the waist, so I'll give it a try. Yay! You now have something to experiment on! A fantastic transformation. It's amazing how simple changes just make a garment fit. Lovely post! Fantastic indeed! I too am impressed by how easily one can change a garment so much! Paige is so creative! I am new to sewing, but did you cut off the excess material? I haven't yet, but I might. It depends on the fabric and how much you removed, and in this case it's not noticeable to have the "leftovers" in there. Hey Paige. Can't sew worth a lick. My mom does all my alterations. 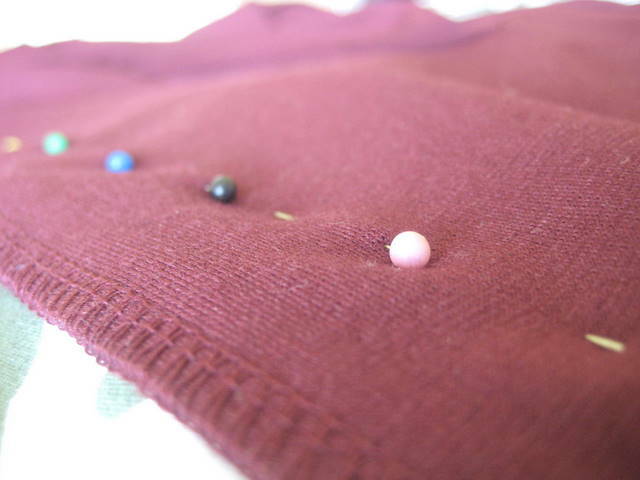 What kind of stitch did you use or did you use a sewing machine? Love how it turned out. My sewing machine has been sitting broken for the better part of a year... maybe it's time to drop it off somewhere. Oh wow! I didn't realize it'd be that easy! I try on something a bit too big and always imagine scrolling through the yellow pages for a seamstress, then having to pay more than the dress to get it tailored. haha. Very nice! Yes, indeed! Easy and so effective! I love it! Finding things that fit right to begin with is hard anyway. Your dress turned out great. It's funny how a simple alteration can make such a big difference. Thanks for sharing.